Prepare to be astonished as Taylor brings his complete magnum opus to Los Angeles, starting this week. Each chapter in this CAP UCLA presentation in downtown L.A. comprises a 6-hour performance. CHAPTER 1 (1776-1836), Thursday, March 15, at 6 pm. CHAPTER II (1836-1896), Saturday, March 17, at 6 pm. CHAPTER III (1896-1956), Thursday, March 22, at 6 pm. CHAPTER IV (1956-2016), Saturday, March 24, at 6 pm. Taylor Mac in Brooklyn, autumn 2016. Photographs by Teddy Wolff. This entry was posted in BOOKS/PERIODICALS, MUSIC, PERFORMANCE, THEATER and tagged "A Time to Be Born: Taylor Mac in Conversation with Barlo Perry", A 24-Decade History of Popular Music (Taylor Mac), Barlo Perry, Center for the Art of Performance at UCLA (CAP UCLA), Harvey Fierstein, Jesse Green, Larry Kramer, Mart Crowley, Paul Rudnick, T magazine, Taylor Mac, Teddy Wolff, The Theatre at Ace Hotel, Tony Kushner on March 14th, 2018 by Barlo Perry. 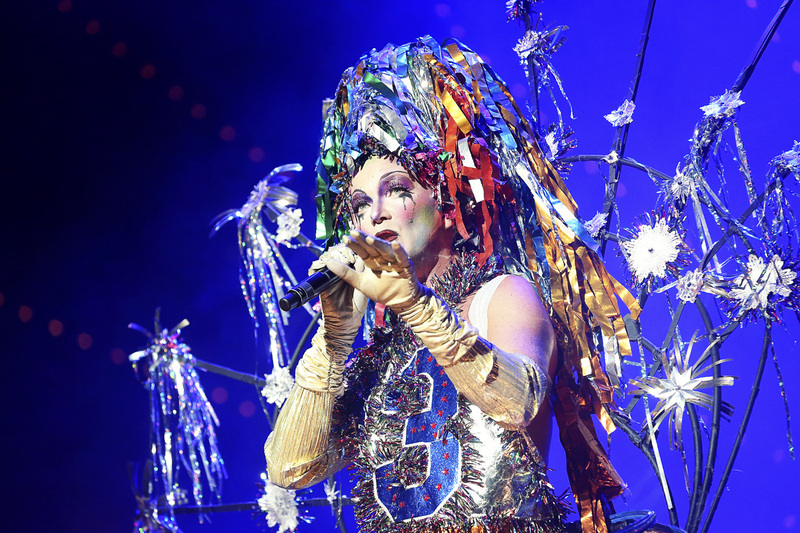 In his first New York stage performance since his 24-hour show at St. Ann’s Warehouse a year ago, Taylor Mac brings HOLIDAY SAUCE to Town Hall. TAYLOR MAC—HOLIDAY SAUCE, Tuesday, December 12. Doors at 7:30. TOWN HALL, 123 West 43rd Street, New York City. Taylor Mac in California, 2017. Photograph by Little Fang. This entry was posted in EDUCATION/ACTIVISM, MUSIC, PERFORMANCE and tagged "A Time to Be Born: Taylor Mac in Conversation with Barlo Perry", A 24-Decade History of Popular Music (Taylor Mac), Barlo Perry, Machine Dazzle, Matt Ray, PARIS LA #15, Paris-LA, Taylor Mac, Town Hall on December 10th, 2017 by Barlo Perry. Barlo Perry: “What was the impetus behind A 24-DECADE HISTORY OF POPULAR MUSIC? This week Taylor Mac returns to San Francisco, where everything started. CHAPTER I (1776–1836), Friday, September 15, at 5 pm. CHAPTER II (1836–1896), Sunday, September 17, at 2 pm. CHAPTER III (1896–1956), Friday, September 22, at 5 pm. CHAPTER IV (1956–2016), Sunday, September 24, at 2 pm. CURRAN THEATER, 445 Geary Street, San Francisco. * from “A Time to Be Born: Taylor Mac in Conversation with Barlo Perry,” PARIS LA 15 (Spring 2017): 78–85. Taylor Mac, with musical director/pianist Matt Ray in top photo. Photographs by Teddy Wolff. This entry was posted in MUSIC, PERFORMANCE, THEATER and tagged "A Time to Be Born: Taylor Mac in Conversation with Barlo Perry", A 24-Decade History of Popular Music (Taylor Mac), Barlo Perry, Curran Theater, Matt Ray, Taylor Mac, Teddy Wolff on September 14th, 2017 by Barlo Perry.